The island has a stigma that it is for young party goers but if you truly get to know the beautiful island, you will soon find out that no matter what budget you are on or what age you are, the island truly does have something for everyone. Lucky for me, I have close relatives that live on the island all year around so I have been able to discover the amazing beaches and the coolest hangouts. Here are my top picks of things to do on the island. If you are going this summer, be sure to go. You won’t be disappointed! Ibiza Town is the heart of Ibiza and a true gem, an absolute must for anyone visiting the island. I adore walking along the gorgeous harbour bustling with lively night-time hippie markets and stopping for a cocktail… or three! Whilst in Ibiza Town, you can walk up the cobbled paths to the Dalt Villa which is one of the city’s biggest attractions. Prepare yourself to for breathtaking views of the harbour and neighbouring resorts such as Talamanca and Figueretas from the top. 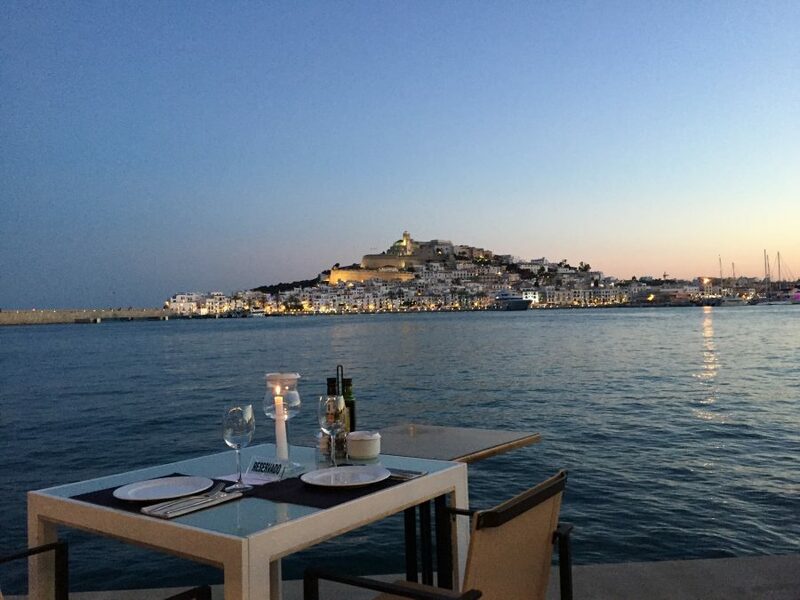 Ibiza Town truly captures the magic and beauty of the White Isle. When to comes to a five star experience on the beach, Blue Marlin Ibiza is definitely up there! The beach club offers a luxurious option for soaking up the sun, fine dining in bohemian surroundings and one of the best musical line-ups on the island. The perfect place to chill and get your tan on in the day and then put on your favourite kaftan to dance the night away! I got taken here for lunch with my relatives last year and I fell in love with the place. It oozes a relaxed, laid-back barefoot chic ambience where everyone is welcome! There is an Eastern Mediterranean menu of healthy and fresh dishes to choose from and after you have eaten, you can go down to the beach of Cala Nova for a swim in the crystal clear water. The perfect way to spend a Sunday on the island. Every time I go to Ibiza, I can’t leave without a visit to Pacha. It is strongly linked to Ibiza with a reputation that’s grown in line with the reputation of the island itself over the years. With over four decades of party-planning under its belt, it boasts one of the biggest rosters of talent on the White Isle. Take your pick from the cream of the electronic music crop, with everything from underground to mainstream to pop classics from the past being represented. I hope my top picks help you plan your trip, thank me later!